For years, one of Android's biggest problems has been Android skins that weigh down the best hardware the platform has to offer. But now the two best Android phones in the world—the HTC One and the Samsung Galaxy S4—come in pure, stock Google Editions. And after spending some time with both, we can confirm that ditching the skins has made them better than ever. Since you can buy them as of today, we've broken down how the two compare with each other, and with the skinned versions of themselves. The One with Sense enabled was already pretty much the snappiest phone we've ever used. With stock Android, it's even faster. Apps open just a little bit quicker and swiping around the UI is just a little bit smoother. The biggest difference you'll notice, though, is that it's just cleaner. Android 4.2.2 (Jelly Bean) is a very minimal OS. Apps like the calendar, the clock, and even the apps drawer are more pared-back and easier to use. Desktop customization, for example, is much simpler. You still get the same great phone on the hardware side. From a design standpoint it's still our favorite phone ever, and it's by far the most satisfying to hold. The screen is incredibly sharp and looks just as good as it did on the skinned version. The dual, front-facing speakers still sound incredible (best sounding phone ever), and when you have headphones in you have that same Beats by Dre EQ, which focuses on the bass a little more and sounds very good (the HTC One has a dedicated pre-amp to help with this). Unfortunately, it's not all good news. The only significant drawback in the Google Edition unit we tested is that the camera doesn't work nearly as well anymore. You might recall how the HTC One's "ultrapixel" sensor took the win in our smartphone camera battle. Clearly, HTC's camera software had something to do with balancing that rather unique sensor, because the stock Android camera app doesn't do nearly as good of a job. Photos tend to be washed out, over-exposed, and under-saturated. Even in low light, it isn't as good. The new camera app itself is very cleanly laid-out and easy to use, but you lose a lot of the advanced shooting features found in the Sense camera app (though many of these reappear in the editing menu in stock Android's Gallery app), in addition to the specialty modes, though you do gain Google's mega-panoramic PhotoSphere, which is fun but is ultimately a small consolation. "The camera hardware and underlying software (image processing, etc.) are the exact same between the Stock and Sense UX versions of HTC One, so there should not be any differences. Our camera tests show that the quality is consistent between the two." That said, the Google engineers saw what we were talking about in our photos, and they are doing more testing, but they believe we have a faulty device. So who knows! Hopefully it's just a glitch with our One. We'll be getting a new one shortly and will update. There are a few other quibbles, too, some small things you may have taken for granted with Sense that you don't get with stock. In HTC Sense's dialer app, you can start punching a friend's name into the number pad (using the superscript letters) and it will quickly pull up contacts. The stock dialer doesn't do this, so you have to scroll through your long list of contacts. HTC Sense also offers built-in profiles—an easy way to switch between Normal, Vibrate, and Silent modes. Not so in stock. Also, the HTC One has a built-in IR blaster for using your phone as a remote control. Not only does the stock version not come with a preinstalled app that lets you use it, but as of right now there are no apps in the Play Store that can take advantage of it, either. We were told that capability would be coming in the next software build, though APIs will still have to be released, and someone will still have to make an app that uses them. There's also the rather steep sticker price of $600, but that sounds like a bigger number than it actually is. For an unlocked, unsubsidized phone it's pretty standard. If you're used to paying $200 for a high-end phone and have your wireless carrier subsidize the rest (as a part of a two-year contract, typically) may experience some sticker-shock. That might sound like it all adds up to a lot of negative, but it's really negligible, especially assuming we were dealing with an abnormal camera. And we haven't even mentioned the biggest advantage of a Google Edition phone yet: Updates. The stock version of the HTC One will all but certainly be upgraded to the newest version of Android right along with (or at least close to) the Nexus program. The One with Sense, by contrast, is still running Android version 4.1.2, which is now more than a year old. For people who want the latest and greatest coming out of Google HQ, this is huge. And trust us, you want the latest and greatest. The stock HTC One runs on AT&T, T-Mobile, and other GSM carriers (i.e. not Verizon or Sprint), and yes, LTE works. We tested it on AT&T's network in NYC, and when we had four bars of LTE we averaged download speeds of over 20Mbps and upload speeds of over 12Mbps. We did have some problems with our radio, initially, but after talking with Google it appears that was unique to our particular test unit. And once we worked out the bug (it chose the wrong APN, for you geeks out there), it performed flawlessly. So, really, our only major gripe here is the camera. We've reached out to Google about it, and will update if we hear anything back. In our initial review of the Galaxy S4, almost all of our complaints about it were software-related. So you would think that replacing TouchWiz with stock Android would fix almost all of its problems, right? Yep. That's pretty much true. Samsung's TouchWiz is such a heavy skin that it slows things down despite the super-fast 1.9GHz quad-core Snapdragon 600 processor in its belly. But while stock Android makes the HTC One a little faster, it's a serious change in the Galaxy S4. Scrolling through menus and across screens is faster and smoother. Apps generally open more quickly, and most importantly, there is now almost zero shutter lag on the camera, whereas the TouchWiz version can lag behind by as much as a second. TouchWiz is also just a clusterfrak of settings and bells and whistles, most of which sit there unused, clogging up menus. Stock Android is starkly minimalist by comparison. The stock apps look better and are more intuitive to use almost without exception. Desktop customization is way simpler. We were also able to install and use Google Wallet on it (not so on the HTC One Google Edition), which is typically blocked by AT&T. Why it worked on the S4 and not the One despite using the same SIM card for both, we do not know. On the hardware side, thankfully, photos the 13MP camera took look almost identical to those on the TouchWiz version. Again, the camera app is much simplified, and though you gain PhotoSphere and easier access to HDR, you do lose a lot of the fun camera modes that Samsung came up with, like Drama Shot (which superimposes several images of a subject in motion into a single shot) and animated GIFs. As you know, the Galaxy S4 features a micro SD card slot, and while you can read files off of it (photos, etc.) you can't take full advantage of it. For example, there is no native way to move apps over to your SD card, as there is in the skinned versions of Android. There are, of course, things you lose that you will miss. Again, TouchWiz's dialer lets you punch in numbers to get to your contacts quickly, stock Android's dialer doesn't (please fix this, guys! ), and you lose TouchWiz's profiles feature as well. TouchWiz has some handy shortcuts to settings within the notification screen and some people may miss those, but for our money, the way stock Android handles it is better, and keeps your notification panel looking cleaner and easier to read. Also, while the IR blaster is technically ready to be used, the API hasn't been released yet, and so there are no downloadable apps that can take advantage of it yet. And, the S4 too, will only work on GSM carriers like AT&T and T-Mobile (not Verizon or Sprint). And as with the HTC One, the sticker price might be tough to swallow. At $650, it ain't exactly cheap, but again, that's not bad for a high-end, unlocked, unsubsidized phone. As we suspected, putting stock Android on the Galaxy S4 made one of the very best smartphones even better. So, you've decided you're going to go with one of these stock phones. Now that the software is essentially identical, here's how the two phones compare. The HTC One is still arguably the best-designed phone we've ever used, and its build quality is unmatched. It was cut from a solid block of aluminum and it feels amazing. The Galaxy S4 is by no means bad, but with its slippery plastic back, there's no comparison. The One is slightly narrower and is a bit easier to handle, too. The screens are definitely two different looks, as you can see in the video above. They're both 1080p. The S4 is a full 5 inches which gives you a little more real estate, whereas the One's 4.7-inch screen means the pixel density is every so slightly higher, making it look very slightly sharper. In the whites HTC One skew a bit on the rosy side, whereas the whites on the Galaxy S4 skew blueish-green. Which is "better" is more a matter of personal preference, though we slightly prefer the One. In the blacks, there's no contest. The Galaxy S4 is like looking into the cold, black vacuum of space, even at full brightness. At full brightness, the HTC One's blacks are very slightly gray. It's still very good, but it's definitely not as good as the S4. As you can see in the video above, the stock HTC One locks focus and snaps shots faster than stock Galaxy S4. But, as we mentioned above, the camera on the stock HTC One was under-performing compared to the original. As a result, the camera on the Galaxy S4 is much sharper, has better color, and better contrast. The One does, however, still stomp the S4 in low light. Hopefully we just got a bum HTC unit, but for now the Galaxy S4's camera is better. Click here for a gallery of comparison shots. The HTC One is the hands down winner here. It's not even close. The stereo front-facing speakers are loud and clear. The S4's external speaker (on the back) is quiet and terrible by comparison. Also, the pre-amp in the HTC One makes listening to music through headphones noticeably better. Unlike full on Nexus phones, the One and the S4 both have hardware navigation buttons. The One has two capacitive buttons: One for Home, and one for Back. You double-tap home to bring up the task-switcher, and you long-press it to bring up Google Now. The Galaxy S4 on the other hand has three navigation buttons: Back and Menu are both capitative and there's a home button in the center which is press-able. You press it once to go home, twice quickly for multitasking, and long press for Google Now. The capacitive buttons on the HTC (for home and task switching) are simply faster and easier to use. Also, because there is no physical menu button, that puts the menu options on screen in apps, which we find to be more intuitive. Navigating around the OS, the HTC One is just a hair quicker. Considering it has the same software and the same processor but it's clocked 0.2 GHz slower than the S4, that shouldn't be the case. But it is. Go figure. We're talking about a very small difference, though. Even in benchmarks, the two were dead even, with one or the other coming out a hundred or two hundred points ahead of the other in both Quadrant and Geekbench 2 tests, but the One came out ahead two out of three times. Go figure. Too soon to tell. More testing required. You want expandable storage? The S4's got it, the HTC One doesn't. Want a removable battery? Ditto. If you like to tinker, you're going to get frustrated fast with the HTC One's lack of fungibility. Similarly, while there are some accessories available for the One, Samsung has built itself a much more robust third-party ecosystem. If you want your phone with a side of stuff, the S4 is the way to go. Last but not least, the price. The HTC One is $600, and the Galaxy S4 is $650. Honestly, these are both terrific phones, and you'd be happy with either. If an SD card slot and removable battery are a big deal for you, go ahead and get the Galaxy S4. Otherwise, the HTC One is our favorite by a nose. Most of all, though, just be glad that you can finally get the best possible versions of the best possible phones on Android. It's about time. 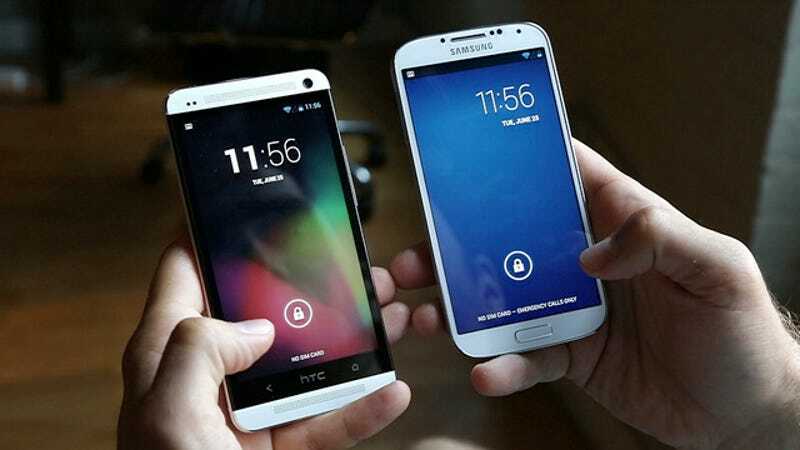 You can get the stock Android HTC One here and you can get the stock Android Samsung Galaxy S4 here. They should ship out by July 9th.